A combination of traditional 5-card poker and slots, video poker machines can be found in land based casinos, as well as at online and mobile gambling websites. Introduced in the late 70s, this poker variation offers a much different play environment than a social game with cards. Nevertheless, many people prefer to play the machines. With an assortment of special effects, decent odds, and variations that include bonus poker and progressive jackpots, video poker is one of the most frequently played games on iPhone, BlackBerry, and Android mobile devices. Video poker is the ultimate gambling excitement for many players, but just as many poker fans prefer a traditional game around the poker table. Since the first live online poker game in the late 1990s, millions of people have played their hand against competitors from around the world. More recently, mobile poker rooms have become available for mobile phones and tablets. With a reliable data connection and a phone that supports Java and the latest version of Flash, it is possible to enjoy a game of poker anytime, whether it’s during your lunch break or while you’re relaxing at home. mFortune recently introduced a mobile Texas Hold’em poker game that supports multi-player gaming with real people. Other cool features include free or real money play, private tables so you can play against your friends, and multiple payment options including paying with your phone credit or bill. There are many benefits to playing both live and video poker on a cell phone. Obviously, the ability to place bets and play games from anywhere is the most appealing. A person is usually never without his or her phone, so it is always possible to get in a couple of quick hands when unexpected waits interfere with their schedule. The convenience of mobility doesn’t detract from the vivid graphics and exciting features of playing poker on a cell phone. It is very similar to playing online. Developers have only been creating poker and gambling websites that support mobile play for a few years, but there are already dozens of options with new opportunities for cell phone players emerging every day. Individuals interested in video poker can find an assortment of free game apps, as well as apps for mobile casinos that include the game in their lineup. Live poker tables are also available in many mobile casinos like mFortune Casino, or players can visit a mobile poker room to place their bets. Be sure to read the establishment’s terms and regulations before setting up an account or making a deposit. The allure of poker will never disappear. From the visual appeal of video poker machines to the anxious excitement around a card table, nothing can beat the thrill of seeing a winning hand. Poker can be played in a land based casino, or on a computer at home. 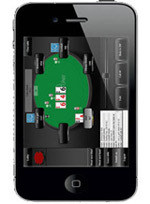 With mobile poker, players can enjoy the same experience from anywhere they can take their cell phone.